WE’RE LOVIN’ IT: Patriots cornerback Stephon Gilmore will be giving local fans a reason to give thanks when he mans the counter and drive-thru window at McDonald’s next week. The football player will be handing out mobile orders to tech-savvy customers at the fast food giant’s Kenmore Square location from 2 to 3 p.m. If people want a chance to meet with the NFL star, all they have to do is use the McDonald’s app and place an order for pick up at the 540 Commonwealth Ave. joint during his shift, and he’ll be there when they go to snag their food curbside, inside the restaurant or via drive thru. ROCKET MAN: Apparently, astronaut Drew Feustel recently touched down in Boston to attend a private welcome-home party. We’re told that the out-of-this-world explorer, who returned to Earth earlier this fall after a 191-day mission aboard the International Space Station, and his wife, speech-language pathologist Indira Feustel, marked his arrival back on solid ground at the Chestnut Hill home of their close friends Bruce Percelay, founder of The Mount Vernon Company and publisher of Nantucket Magazine, and his wife, Elisabeth. Celestial celebrations aside, the Feustels were also in town to receive a recognition from the American Speech-Language-Hearing Association. The pair were honored as “Stars of Communication” at the ASHA 2018 Convention, which was just held at the Boston Convention & Exhibition Center. 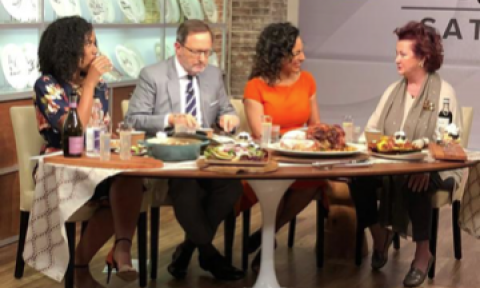 SCREEN TIME: Boston restaurant legend Lydia Shire was featured as a guest on “CBS This Morning” on Saturday, when she spent the early hours of her day chatting with hosts during The Dish. The fiery-haired chef, who’s known best for her scrumptious Italian eatery Scampo, spent the segment digging into her family’s Thanksgiving traditions — which includes cooking a big hunk of pork for her turkey-hating husband, Uriel Pineda — her early efforts to make it in the culinary world — like hawking the diamond ring she from her first marriage so she could put herself through Le Cordon Bleu’s program in London — as well as her famous friendship with the late and great Julia Child.